This rather strangely presented chart drawn in 1589 is now set upon a sheet of cut down vellum, perhaps on both vertical edges, to fit as required as binding by a Notary, indicated by the eight stitching lines and folds. It has suffered distortion due to a fold above its centre line East/West and this affects the accuracy of the North East quadrant, as described later. 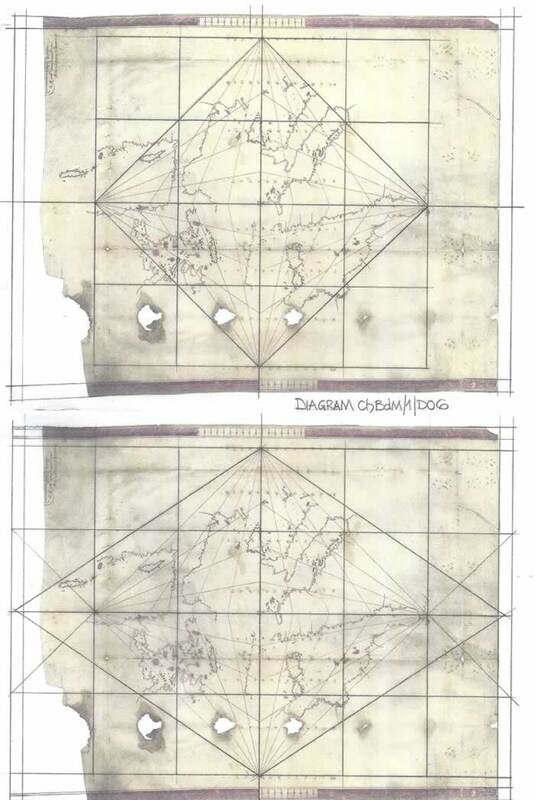 The format appears to be as if four atlas pages have been set (off centre) to an intriguing diamond shape which has subdivisions of 11.25; 22.5 and 33.75 degrees set out from the N/S and E/W positions. The four sections of the chart do not appear to be bound by or accord with any of the Diamond lines and thus they appear to serve no purpose other than decoration. Those four atlas pages are set on the vellum such that their close proximity precludes most toponyms from being appended if it was so desired. They are crowded one on the other in a most unnecessary fashion and thus there must be a very good reason for such a conflation. However there are obvious features which at a glance may or may not allow the four sections to join forming a homogeneous chart, which may be the origin of these pieces. But of course it is likely they are just as they appear atlas pages. There are appended to the vellum two scale bars, one having 8 sections of 50 Miliaria and the other 16 sections of 50 Miliaria, a measurement easily proven. 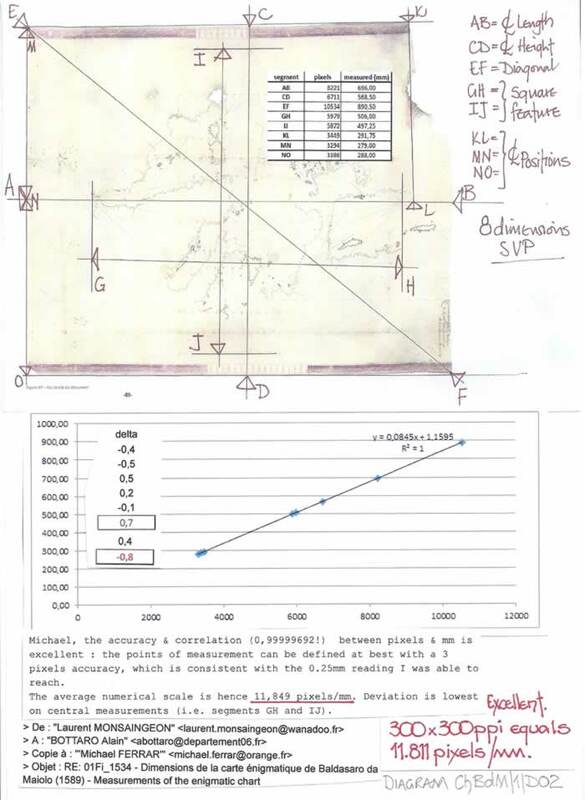 To enable a full size plot of the chart to be assessed and not knowing if the original scan at a given 300 x 300 p.p.i. was accurate, I requested actual measurements to be taken to the nearest 0.25mm. Therefore the standard mathematical calculation of 300 p.p.i. equals 11.811 pixels/mm was made and as the diagram indicates proved correct. Thus using Microsoft Picture Manager the charts pixel measurements can be converted to millimetres as necessary, for internal measurements, but that implies unwarranted accuracy. However, that will not aid the use of the scale bars in measuring the individual chart sections as firstly we do not know if those scale bars are accurate to the actual “wooden” measuring rod used to construct the chart, and thus how accurate they are when transferred onto the vellum as examples. I therefore caution over reliance on 20th century measuring tools which are far in excess of the accuracy of the 16th century and suggest using the scale bars may in fact illustrate the original intent more adequately. Thus I consider all measurements should be via the Miliaria scale to understand the charts inner workings. A study of the scan at high magnification indicated that the folding of the chart caused a bulging outward of the vellum such that when viewed on the diagrams it will in fact appear to be “into” the vellum. It is however not continuous across the whole chart but is mainly limited to the NE quadrant which is that of the Aegean Sea area. It decreases as the fold moves westerly and is quite hard to trace as it leaves the N/S diamond centreline and approaches Sardinia. The internal lines of the diamond show little or no distortion at this point, but are well distorted in the affected areas. Thus to be able to investigate the charts inner working a method was required to alleviate that distortion. That however being a bulge or ballooning outward of the vellum was akin to the age old problem of flattening a “ball”, which led to the various projections derived for world maps and charts. There was however a solution available, not perfect, but given the scale of the charts four parts it was more than adequate. Study the chart and note that the islands of Crete and Rhodes have been drawn twice with their accompanying isles and coastlines. Crete has been drawn once across the “bulge” and again as part of the SE quadrant illustrating the eastern Mediterranean Sea. If the distorted plot is studied it will be seen that there are two diamond lines which are distorted, one set at 22.5 degrees to the north and the other 22.5 degrees from the east. But crucially the Cretan coastline affected just happens to be of a rectangular form. 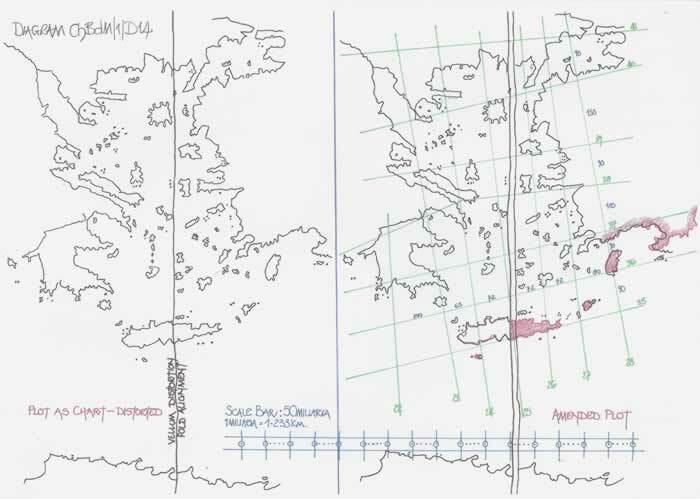 Study the complete Cretan form in the SE quadrant and the two sections affected are perfectly drawn and hence can be used to set out the whole Aegean Sea chart correctly by dividing it along the bulge distortion line and thus a corrected chart plot is quite feasible and accurately drawn. As a general observation, the four atlas pages are set out in a rotating pattern with each individual quadrant or putative quadrant (as they do not comply with the diamond centrelines) having a different orientation which is as shown a clockwise rotation of the individual chart north points. Why this should be so is discussed later in the text. However because the atlas pages and diamond are so intrinsically linked by their contiguity what must be discussed is the order of draughting. And here I can only report that my study of the scanned chart appears to show ambivalence in that order. In some areas the atlas pages are first and in others the diamond form could be first. But that raises the question of the setting out of the whole chart which would appear to be seriously awry. The original researcher comments upon the draughting sequence in his text. If the diamond was drawn first then there is no reason why the four atlas pages could not have been set out in a more orderly and visually acceptable manner. The diamond lines have no function as they are not winds but merely a geometric construct of little import. The vellum sheet has more blank space than utilised for the charts and we must consider that much more may have been intended to be drawn. But if there was a cogent reason to squash the charts into as small a space as possible, leaving no internal space for the normal toponyms then perhaps it was also a trial run, a copying exercise, a miniaturisation exercise to teach the art. But a study of the overall vellum and its diamond form may indicate other reasons for the format. 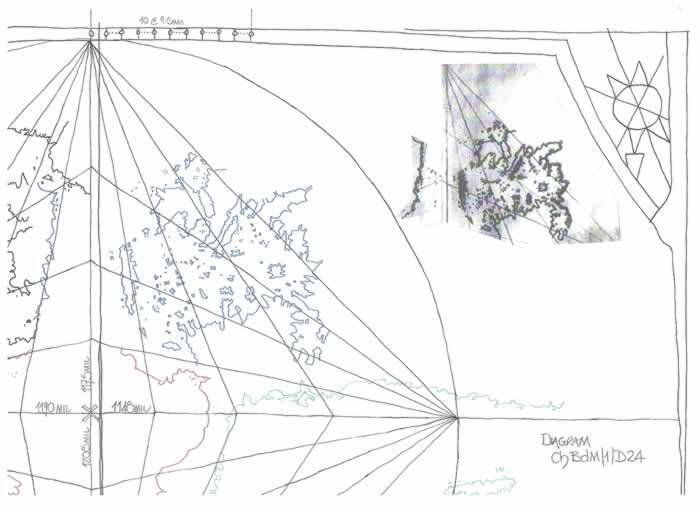 On diagram ChBdM/1/D06 I have indicated the possible original size of the vellum and its geometrical origins. The upper part of the diagram shows how by using the diamond form the 4 x 4 square, another set of squares can be drawn which produce a putative setting out of 6 x 4 squares and each quadrant is thus formed from a 2:3 base. Consider this fact; the natural Tangent of 33.75 degrees is 0.66818, but that for medieval man was thought of as 0.66667, and thus a precise 2:3 ratio subtending an angle of 33.69 degrees. 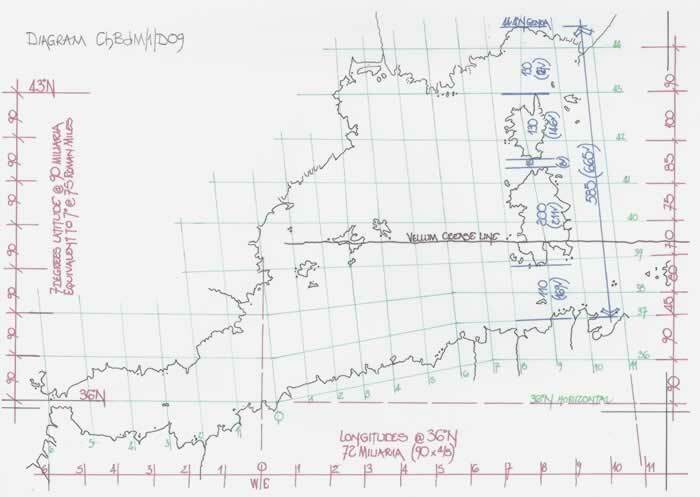 Even if the western edge is kept as existing and the eastern edge is extended by the same amount the choice of 33.75 degrees would still be applicable given the drawings accuracy. Thus I posit the simple theory that the vellum was subdivided, having been sized accordingly and the diamond shape set centrally as the lower section of diagram ChBdM/1/D06 indicates. My reasoning is explained in the concluding part. 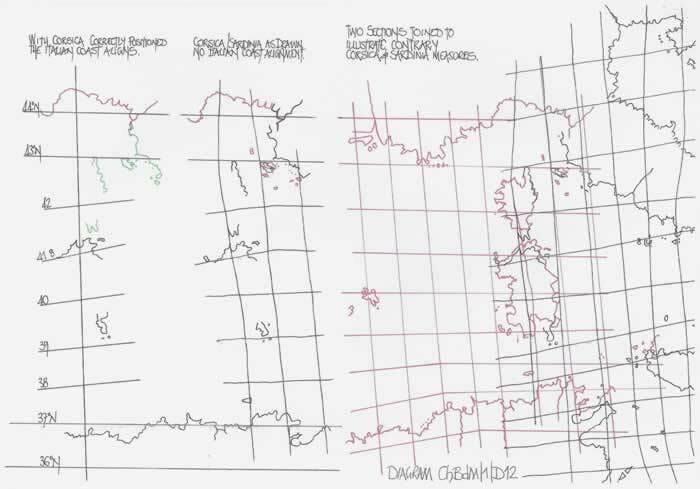 Turning to the four atlas pages, on diagram ChBdM/1/D07 I have redrawn them “sans diamante” to illustrate the conflation of the four and the large area of vellum unused in the process, which I consider must have been a very definite idea. The lower part of the diagram has the four shapes drawn which encompass each of the atlas pages as a putative minimal space requirement. It clearly indicates there was no necessity for the conflation on this vellum and that each could be moved into their corresponding quadrant to achieve a successful rotating plot. The progenitor of the cartographical clan was Vesconte, born c1475 and died c1551, that is at 75 years of age. His son Giovanni Antonio was working with him and signed a chart in 1525. In all probability he was 20/25 years of age to have gained the skill required to aid his father who was in 1519, “Magister cartarum pro navigando” (official cartographer to the Republic of Genoa). Thus G.A. was born c1500 and is thought to have died before 1600 and his son B da M perhaps only five years later in 1605. The fact that Vesconte lived 75 years does not preclude his sons achieving their century, but as with much “historical” fact this seems unlikely and hence I cannot estimate the age of B da M in any meaningful manner except to say that if his father G A was born c1500, B da M c1525/30 then he probably achieved his grandfathers age. However, there is a spanner in the works. In the chapter HOC3/1 ch7, “The Renaissance Chart Tradition in the Mediterranean”, Corradino Astengo alludes to altered dates on charts by the Maggiolo family to ensure continued stipends from the Republic of Genoa. Within HOC3/1 ch7, pages 209 to 121 it contains a very full discussion regarding the Maggiolo Clan. 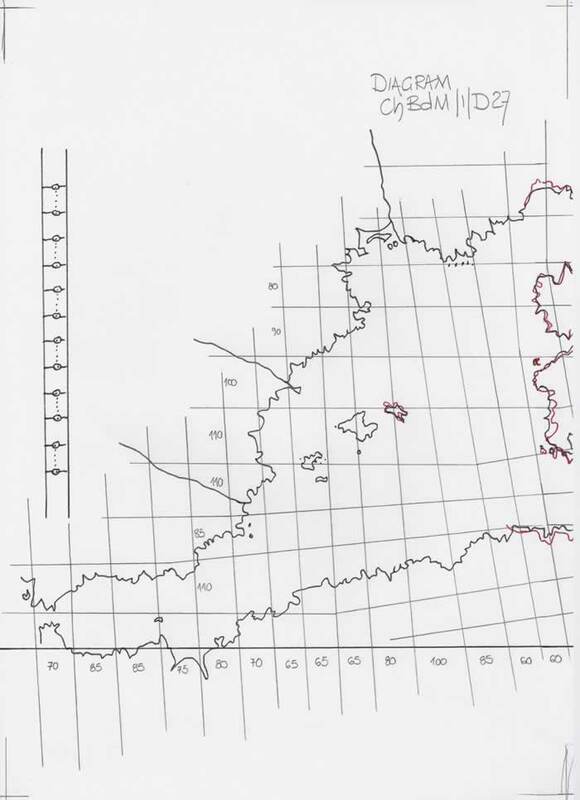 I have added this preceding section merely to indicate the problems involved in attempting to understand how and why and when a chart was drawn, particularly one as bizarre as this, or is it?. As can be seen on the copy of the original scan section this is a fine rendition of the western Mediterranean Sea from Corsica/Sardinia to the Strait of Gibraltar and Cadiz. 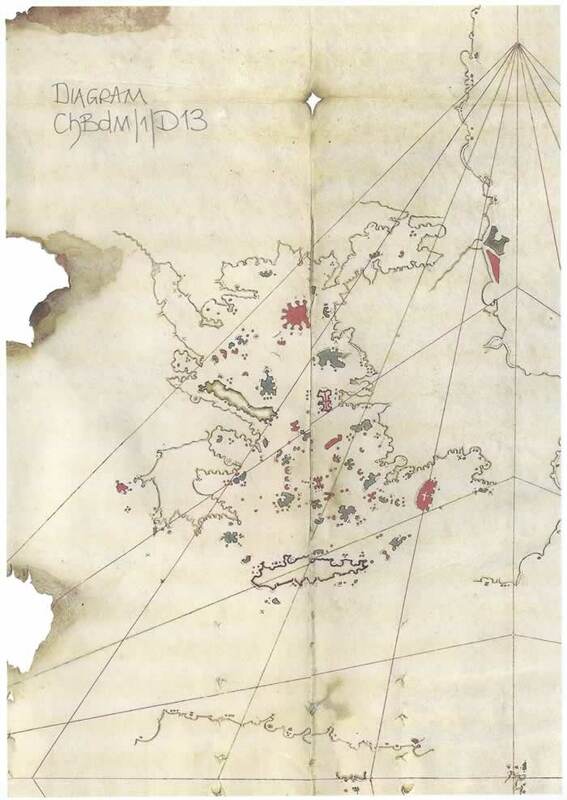 It is partially coloured and mainly uses red on the minor islands so that they are not lost in the overall picture. The vellum crease is visible but the diamond lines are generally correct and thus any distortion here is probably negligible. 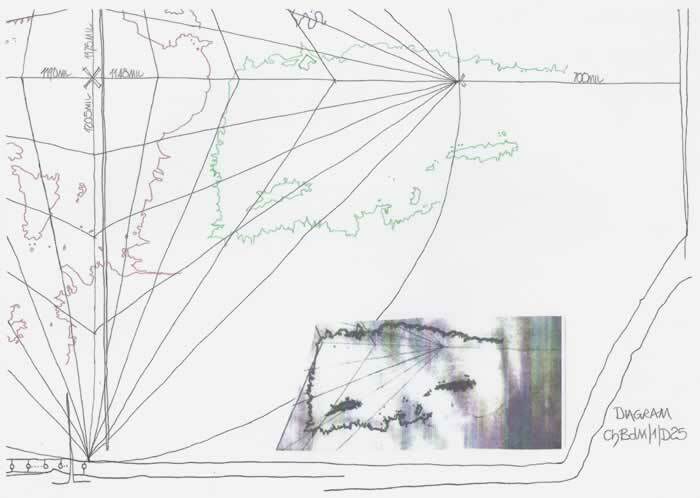 On diagram ChBdM/1/D09, I have indicated the distance measures used for a putative geographical graticule. They are 90 miliaria latitude, and, 72 miliaria longitude which is determined at 36N latitude. However a close examination of the chart indicates the format of Iberia is quite acceptable and the latitude for Genoa is correct, but thence the standard problems that have already been amply illustrated in many of my texts and on most charts, that of the shortened distance from Genoa to the coast of N Africa near Tabarka causes that coastline to be moved northwards and thus the 37N latitude misplaced. Thus the N African coastline has been distorted northerly from approximately the putative Zero Longitude to the 11E longitude at Cape Bon. Therefore we can assume the B da M has copied what may be considered a standard format distortion, in all probability on each and every Maggiolo chart also, and is well described in my text ChFB/1, Francesco Beccarri and his chart. This is the first noticeable distortion on a chart or atlas page when the west coast of Iberia is not drawn and thus from c9E longitude the charts and atlases take on an ever changing slew northerly. Diagram ChBdM/1/D10 commences in the west with a fragmented representation of both Corsica and Sardinia and no corresponding N African coastline to follow through a putative 9E longitude. The atlas page appears to be drawn as though it should link to the NW quadrant chart, which itself had a small section of the NW Italian coastline and the western end of Sicily as well as the N African coast to Cape Bon drawn. Thus if we independently set out the putative geographical graticule for this atlas page it can be compared with the first section discussed to indicate continuity and accuracy. 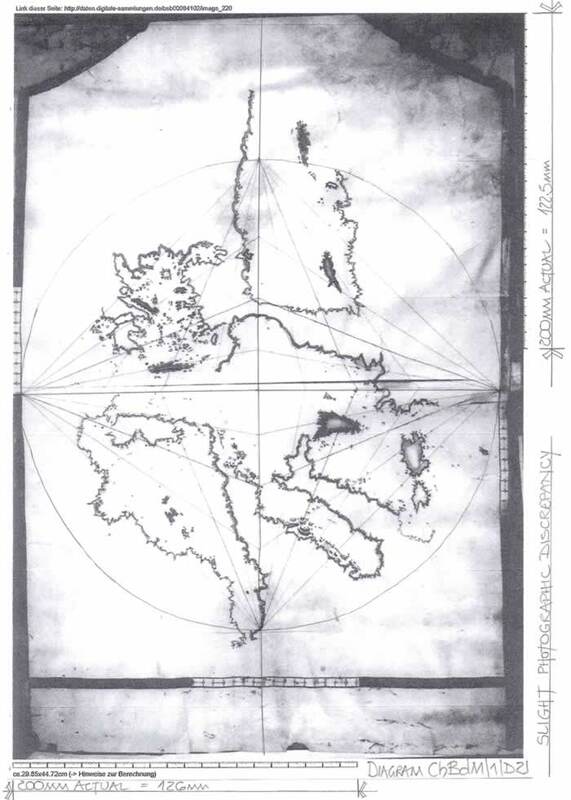 Overall from 9E to 21E and 31N to 45N the atlas page may be considered acceptable; that is until Corsica and Sardinia along the 9E longitude are assessed and an attempt is made to join this SW quadrant to the NW quadrant, as follows. 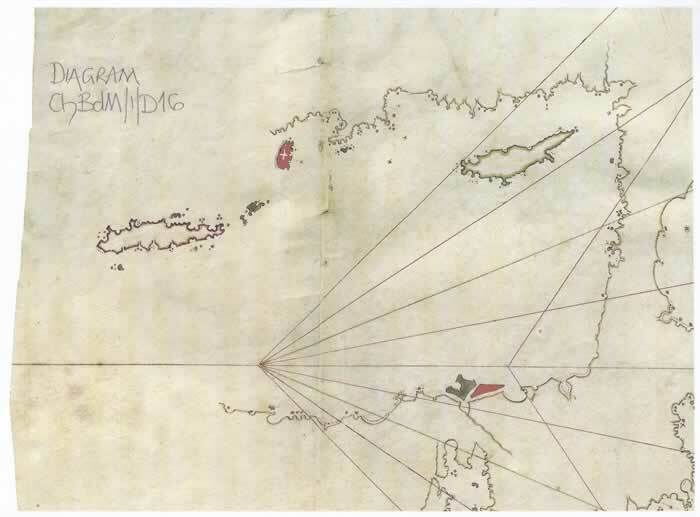 Diagram ChBdM/1/D12 has been divided into three sections commencing on the right hand side with an attempted overlay of the islands Corsica and Sardinia from the two quadrants. Immediately it can be seen that the NW plot has a reduced size for these islands which the SW plot endeavours to correct. Thus by aligning Cape Corse on each plot, the only common point feasible and actually indicated by the charts themselves using the 43N alignment, we can record the mis-match of the whole supposed junction of these two plots and illustrate how Cape Bon moves to the south closer to its geographical position at 37N/11E. The middle diagram indicates that there is a mis-match from Corsica to the Italian mainland at Piombino, although the Isle of Elba appears to be correctly positioned. This is evidenced by the fact that Corsica has been drawn west of its geographical position apropos Sardinia, as the curved longitude 9E indicates. 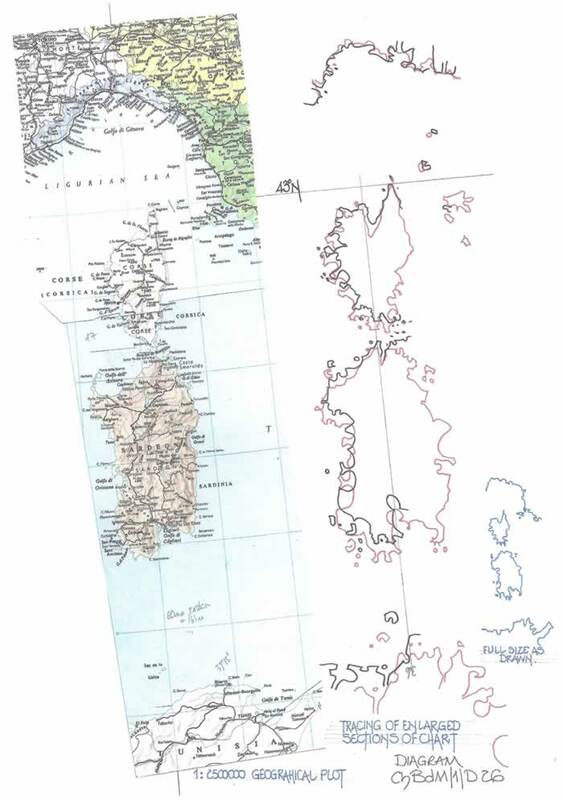 Therefore the third part of the diagram, on the left of the sheet, has Corsica moved easterly to the correct longitudinal alignment and then the appended Italian coastline at Piombino and to its north is correctly aligned to join the two atlas pages properly in a geographical format. The N African coastline has been positioned apropos the enlarged and correctly dimensioned Corsica/Sardinia plot and hence the 37N latitude is correctly positioned. 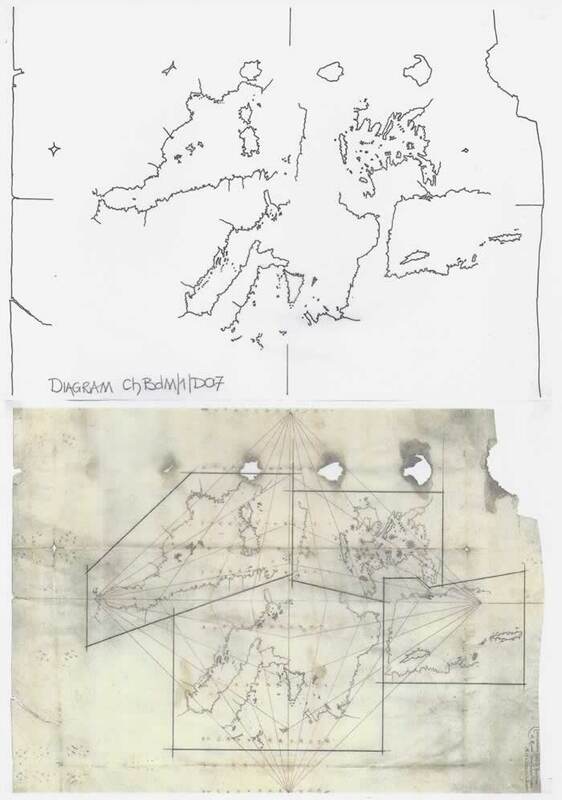 Therefore at this juncture it is fair to opine that B da M is now just copying previously drawn atlas pages which exhibit the same errors as have been shown to exist for centuries within Portolan Charts and Atlases as described for example in my text ChATL/1. As previously discussed this section of the chart unfortunately has a major distortion within the vellum. 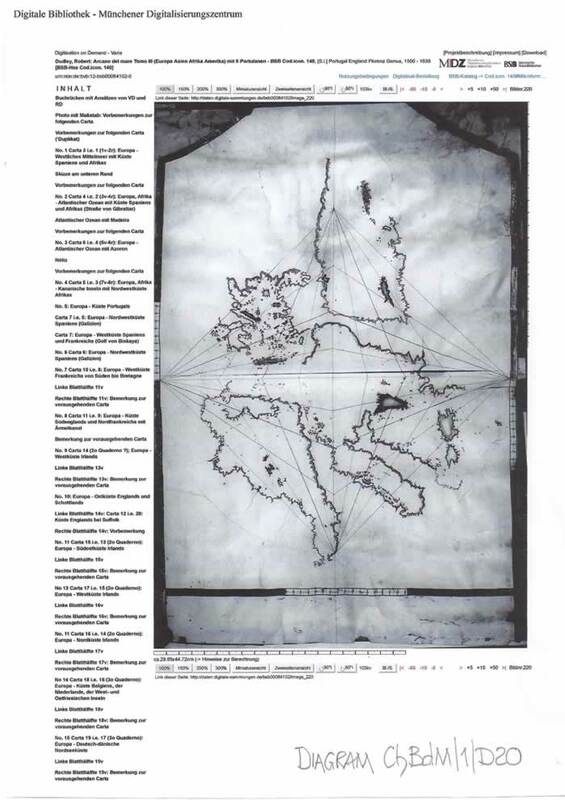 It has been “rectified” via the plot for the Island of Crete and thus can be assessed apropos the general accuracy and setting out of the section and whole chart. Basically it follows the dozens of charts already researched in my oeuvre and illustrates the false distance measures from Crete at 35N to Constantinople at 41N. This on most charts is actually an extra degree of latitude inserted into the plot. 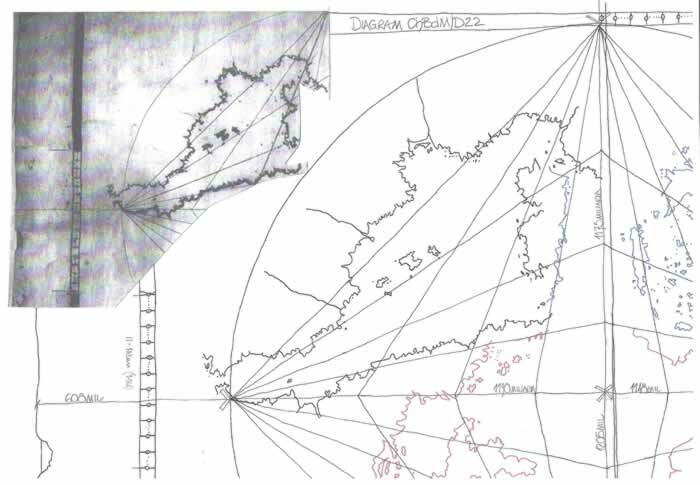 Diagram ChBdM/1/D15 illustrates the junction between the SW and NE quadrants and amply illustrates the changing geographical graticule which is their junction line. This section of the chart is perhaps, as with many other charts investigated, the most successful area. The coastlines of Anatolia, The Levante and Egypt are not as problematic as those of Italy and the Aegean Sea. 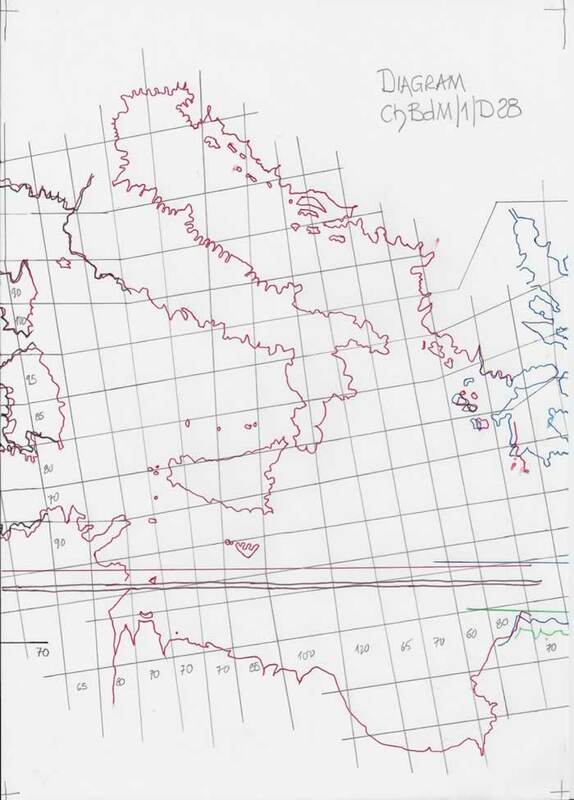 Thus we observe a successful rendition of the geographical plot, but as with all small scale charts, accuracy and measurement are problems for determining the precise nature of the plot. The first problem to be noted is that drawing accuracy on these 14th to 16th century charts varies from the sublime to the ridiculous. Thus idiosyncratic features can be used to ascertain lineage and to that end I offer simple examples of what may have been the original idea for these charts format. 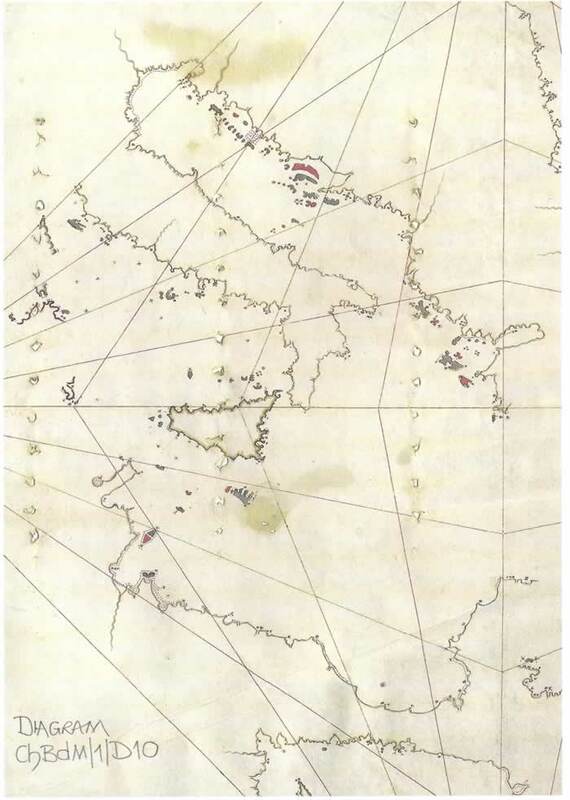 The c1510 chart from Dijon Library has the islands at the mouth of the Rhone and Nile corresponding to the 1559 chart. Italy and Sicily are similar as are many other features which the diagrams can illustrate, Thus we can infer that the Maggiolo clan took cognizance of previous charts and as has been amply illustrated in several texts were just copyists, using data that had existed for centuries and amplifying it as exploration data arrived. 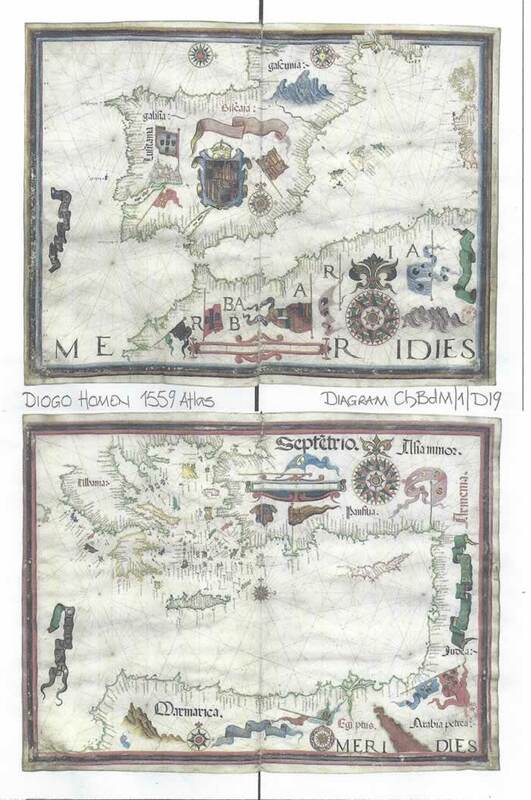 Even atlas charts by Diogo Homen, dated to 1559 and drawn in Genoa are very similar in content, and this is just after Vesconte Maggiolo passed away (1551) and the family took over. 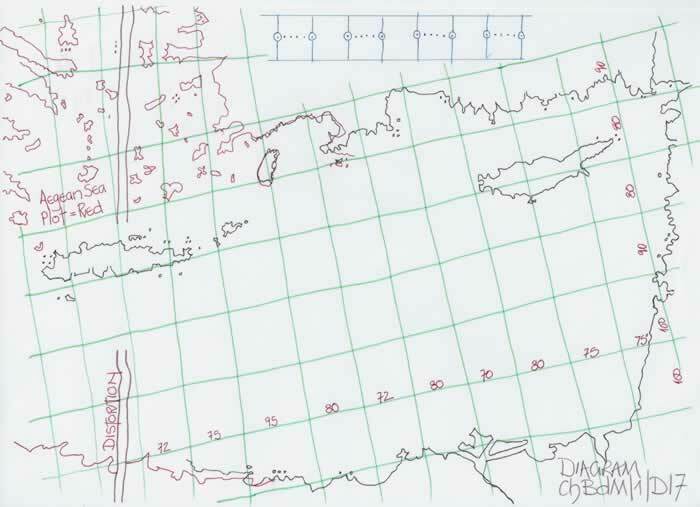 “In Genoa, in fact, chart making remained a private enterprise but under a state controlled monopoly: the result was that for about 150 years the only cartographers in the city were the Maggiolo family”. Thus if the Maggiolo clan were taking their data from previous charts and from these other cartographers who supposedly did not exist in Genoa at the time, and, were changing the dates on their charts to ensure continued payments, this chart can be a copy of virtually any cartographers work and ideas, and thus perhaps as I have opined a drawing exercise for a different presentation. The text and charts entitled” Dell’Arcano del Mare” is a work by Sir Robert Dudley from the 17th century and comprises three volumes which make up a maritime atlas of the known world in c1635. It was first published in Florence Italy, 1645-46 and took some 10 years to engrave, there being literally hundreds of charts in those 3 volumes. They are available from the Bayerische Staatsbibliothek (q.v. appendix). The chart we are now studying is from the 3rd volume and is to put it simply a smaller version of the Baldassare da Maiolo 1559 chart. Firstly it is presented at 296.5 x 447.2mm and is therefore virtually the same size as a sheet of A3 paper. By utilizing the millimetre scale bars it is possible to present it full size, but as with most photographs there is a slight distortion from the lens. The B da M chart is 696 x 568.5mm and considerably different in scale therefore. At close to A3 size it is quite difficult to accurately confirm its internal measures given the draughtsman’s skill and use of a “scale ruler” as precisely as we would wish. We are as I have opined many times obsessed with accuracy and do not appreciate the vagaries of a large number of distance measures and hence distorted measurements. It is a black and white representation of a four square presentation as seen previously, but because of its reduced size it appears to have been even more conflated such that in several places it is difficult to ascertain which part of the chart belongs to which of the four charts. Thus I have decided to colour code the four sections on the diagrams which follow. But again, it is worth considering why when this small parchment sheet has space for each section to be drawn quite separately from the next and avoid the confusion did it not happen. Why both charts are so conflated is a mystery although tentative ideas can be postulated as I explain in the concluding section of this text. It is basically a rectangular parchment sheet which has been modified by the drawing design to emulate a typical skin by using the external framework of the design. There are then two major lines forming the cruciform set on the centrelines of the length and breadth of the sheet. A circle has then been scribed to, one presumes, ensure that originally the diamond shape was accurately drawn, using the height (breadth) of the sheet as the circles diameter. However, it is now far from accurate, being 1190 miliaria west and 1148 miliaria east of the centreline and although some of the inaccuracy is due to distortion, some is no doubt due to the fact that the grid centre may not be the circle centre and thus it could be four distinct quadrant curves. From the photograph copy available it is hard to determine if the perimeter has been reduced to any great extent but the design patterns in the NE and SE corners, perhaps wind roses are intact. There are three scale bars, north, south and west, but the southern scale bar is distorted by a tear in the parchment. There is a second tear or split to the east of the centreline, but given the small scale of the actual drawing it is probably unwise to try to calculate any error in the SW section of the chart. But on the scale bar we can see that a c40 miliaria discrepancy occurs, although the tear is limited in length. The circle radius was in all probability 1200 miliaria and thus the parchment may have been cut back to allow for the inner false skin design to be surrounded by a second perimeter as can be seen on the south side. 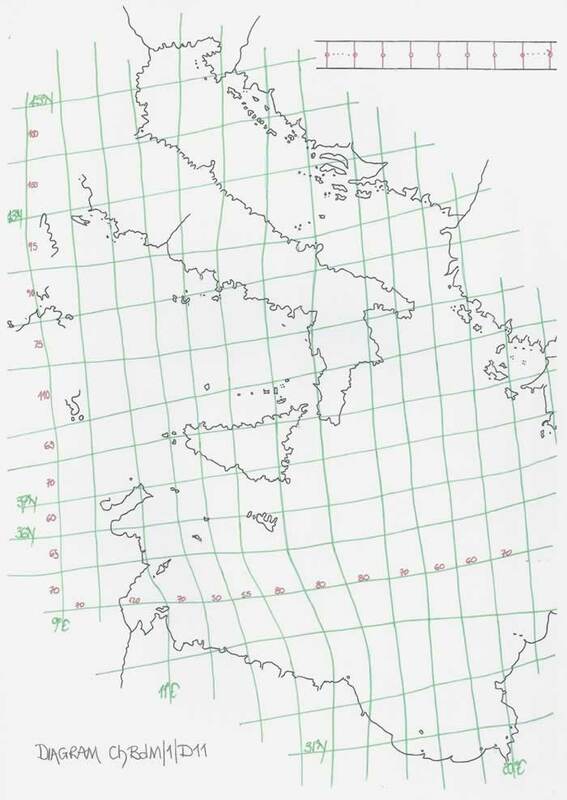 As seen on the B da M chart, Crete has been duplicated along with the Island of Rhodes which enables those two sections to be aligned with some confidence; that is of course if the isles have been accurately drawn. Curiously the western scale bar bordure is positioned such that the N African coastline finishes at a similar point from the eastern bordure. North/South, other than the fact that Menorca has been drawn close to the circle, the actual limit of the drawing is similar to the first chart. Thus we can ask if the whole has been set out using a grid pattern on the parchment to locate extremities, or at least indicate their desired positions and thus is a drawing aid which was necessary for its construction. But one point is pertinent in the sizing of the chart; it is undoubtedly a 3;2 rectangle, but then the 296.5mm would equate to 444.75mm length when we are given a measurement of 447.2mm. This may well be one facet of its production as will be discussed later. I have reproduced the original Munich Chart at 160% scale to enable a more thorough examination and extricate the four sections from the overcrowded presentation. I have maintained the format of the original and utilized the Western Mediterranean Sea quadrant as the orientation for the whole chart and its description. 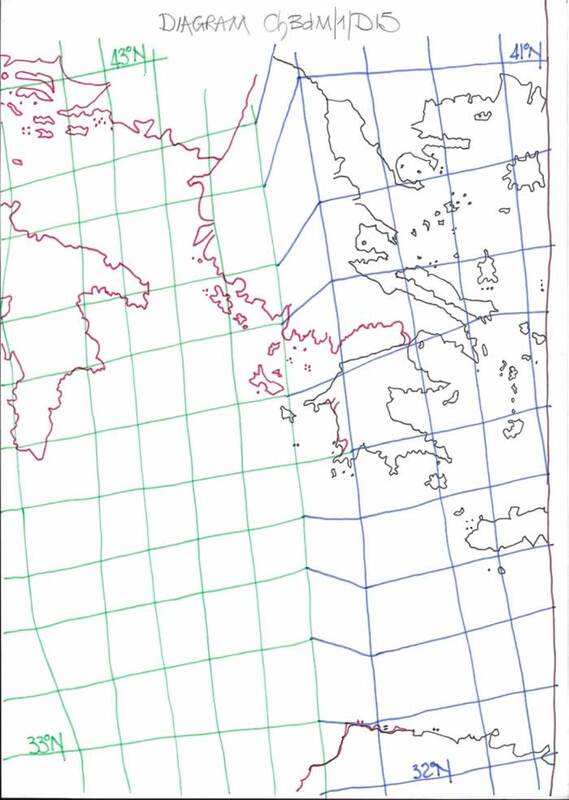 This section of the chart has a good representation of the sea area and neatly aligns Cape Corse through the Isles des Hyeres at 43N. It then indicates that the putative longitude through Corsica/Sardinia would slew to the west as is normal on most Portolan charts. The putative geographical graticule has been appended on a putative reconstruction of the whole chart to be discussed later. Perhaps the most accomplished of the four atlas pages with a full Corsica/Sardinia, Italy, Sicily and Gulf of Sirte well drawn and epitomising the central Mediterranean Sea which was the domain of the Roman State. This is the main section for trade and influence for centuries and is therefore perhaps the best surveyed area. The southern scale bar in this section is distorted by 30/40 miliaria and the main split affects the north/south distance to the south of Cape Bon. But such a small scale chart will be only marginally affected by such distortions. However we must be cognisant of them as when it comes to aligning the four sections due attention to this fact must be given. THE NORTH EAST QUADRANT, THE AEGEAN SEA. 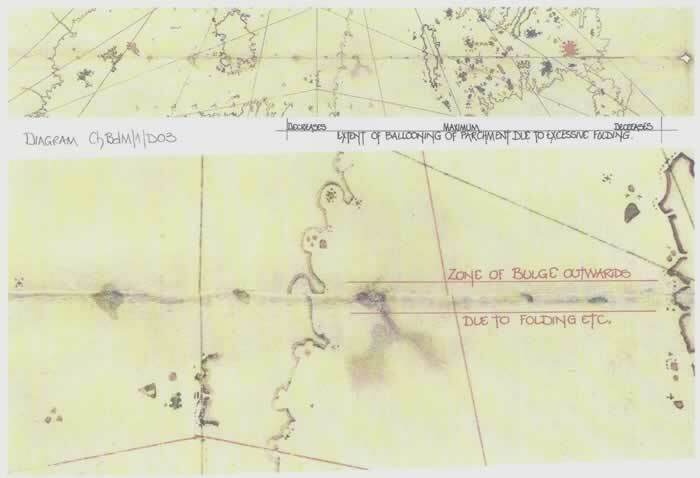 This is generally the problematic area of Portolan charts as it was very hard, possibly nigh impossible in ancient times to survey unless very accurate latitudinal measures are taken at various points to provide a basic form for the ensuing survey to be appended to. Each of my previous research packages has indicated that the Aegean Sea has been over estimated in size by approximately a degree of latitude. That is, 75 Roman Miles or 90 Miliaria, our 111km. 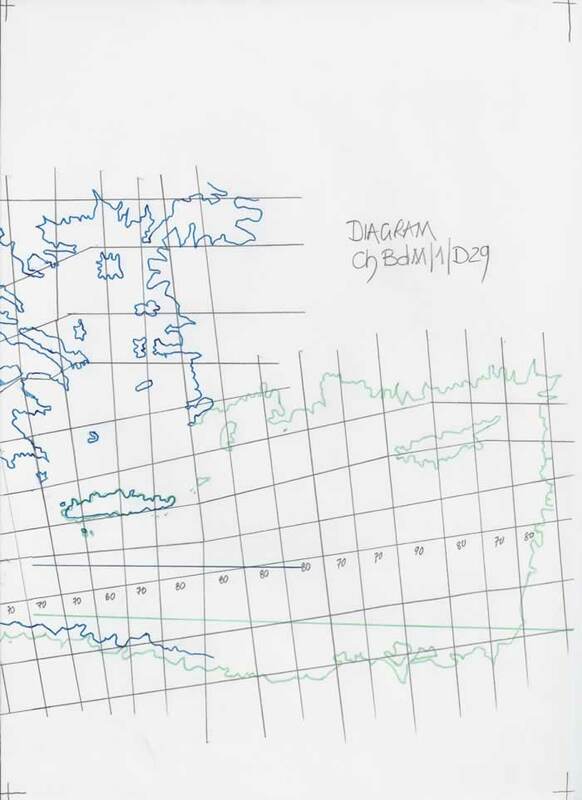 Study the shape and form of the Aegean Sea and unless there are certain determinants by latitudinal measures it is probably not possible to survey it by land or sea. 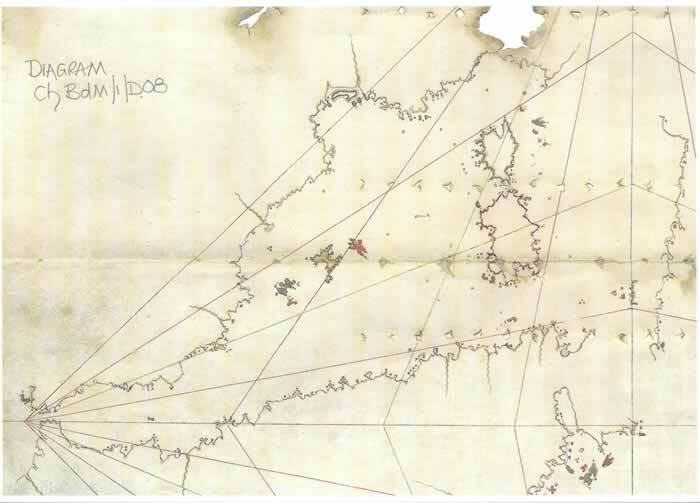 This section of most Portolan charts is normally quite accurate, but why should that be so? Very simply, it is the section of the Mediterranean Sea which had the most exploration and geographical knowledge applied to it. Thus from Ancient Egypt via Macedonia to Rome this was the core of civilisation. That neatly ignores, but by no means actually demeans the Carthaginians and their fantastic ancestors who were seafarers par excellence, but we just do not have the historical data for use. 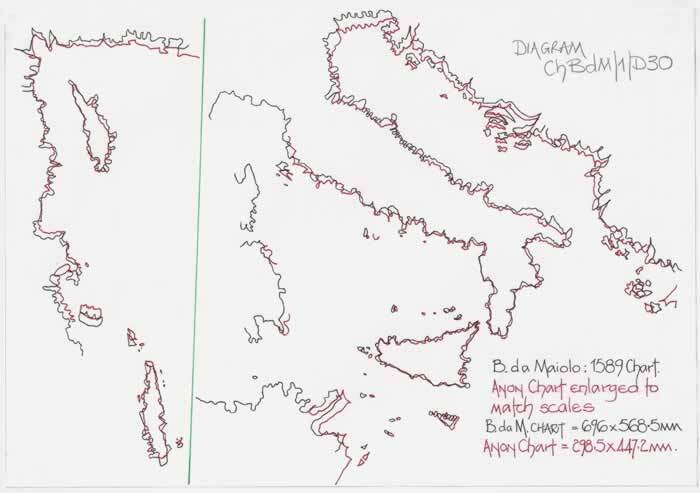 To illustrate the minor discrepancies within the chart the diagram presents the islands of Corsica and Sardinia full scale size as drawn, and then at a much larger scale chosen to approximately emulate a geographical atlas page. 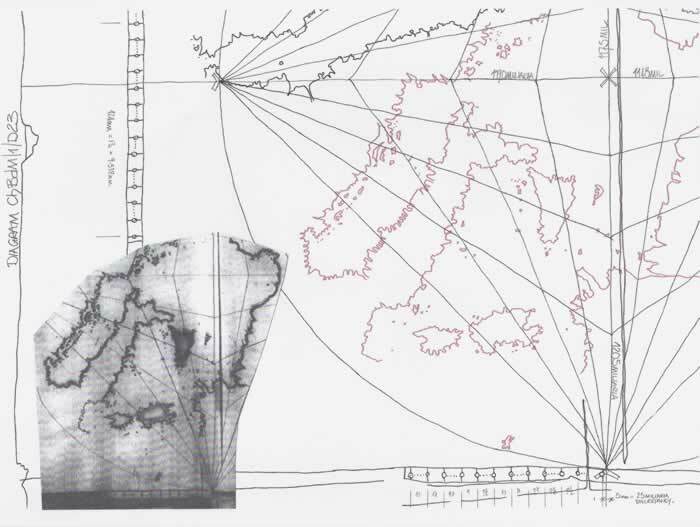 The islands can be shown to have been drawn quite accurately and positioned apropos the 43N latitude and 9E longitude in a geographical manner and thus are a fair reflection of the 1:2500000 scale atlas pages. 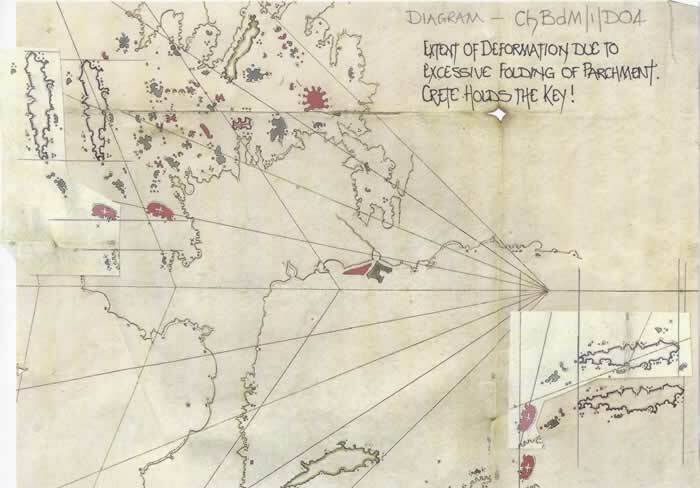 Have the islands had been drawn by B da M on his chart as it is evident that this draughts- person is far more accurate in his positioning. This though is a rather small scale plot to be certain and as I later opine may be the same draughtsman refining his skills. To construct a complete graticule it was necessary, (although not always advisable), to join the four sections into a single presentation of the Mediterranean Sea they represent. As the scale bars appear to be standard and represent a Miliaria measurement, it is plausible to expect latitudes to measure 90 units and longitudes based on the Mediterranean Sea centreline of 36N to be 72 miliaria. Given the small scale of the chart sections, it being an cA3 parchment sheet with the diagrams forming little more than an cA4 area in the centre, I have enlarged it sufficiently only to produce a meaningful assessment which will hopefully allow the whole to be fully understood. There are three sheets which have corner marks to ensure they can be set at the same size/scale with the centre sheet overlapping to allow a complete chart to be assembled. There are no surprises and the overall impression is really just more of the same emanating from the first extant charts by Petrus Vesconte, c1311 onwards. It has a surprising accuracy which is probably slightly greater than the original B da M chart, however, that could be considered subjective and not objective research. Obviously as they are so different in size, 696 x 568.5mm to 447.2 x 298.5mm they can only be compared visually set alongside each other. However that visual analysis indicated a very close drafting correspondence between the two and thus I decided to reproduce part of both charts at the same scale for comparison. I decided that the distorted areas should be avoided and thus have reproduced the partial charts of Italy and Sicily plus the eastern Mediterranean Sea of Cyprus and Crete. Thus one chart, the Munich small chart had to be enlarged to match the scale bars precisely and I then drew both being the same enlargement to give a surprisingly good overlay of one chart on the other in the areas chosen. Italy and Sicily are certainly taken from the same original chart as the idiosyncratic shapes clearly indicate. But obviously the question of originality between the two must be answered or at least attempted. We know that B da M was active in Genoa until c1605 and Sir Robert Dudley is thought of as an excellent cartographer and seafarer. He lived from 1573 to 1649 and because of family problems left the United Kingdom for Italy in 1605 where he was then employed by Ferdinand 1st and Cosimo 2nd, Dukes of Tuscany, in Florence as a cartographer. Thus the B da M chart dated 1589 may well have been available for a smaller copy to be made commensurate with the size of an atlas not a Portolan chart. It appears the atlas was conceived in 1635 and took 10 years to engrave and was then published 1645/46, with Sir Robert Dudley living to see his creation. 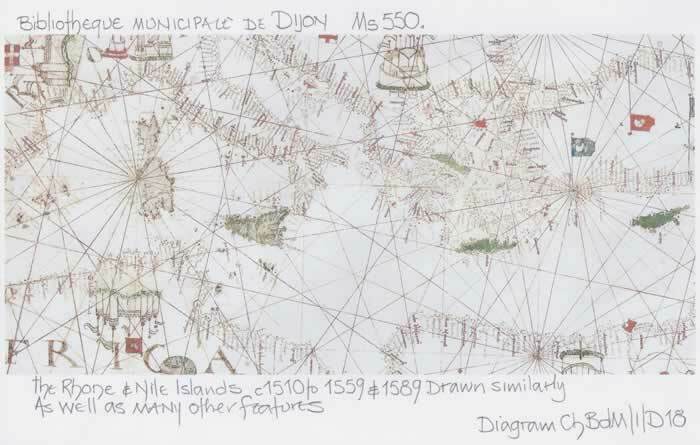 There is also the possibility that the engraver of the atlas, Antonio Francesco Lucini may have previously copied the B da M chart and given it to Sir Robert Dudley for inclusion in his atlas as a curiosity compared to the other charts which Sir Robert Dudley has drawn. However other possibilities do exist. Study the charts engraved by Lucini for Dudley and then the five portolan charts included at the end of the third volume. Firstly the chart N0 80 is signed by “Jacobus Maiolo condam Vesconte” & the next three including the chart under discussion are then unattributed, but the last is drawn by Thomas Hood. Thus our chart is N0 83 in the list from 80 to 84, as per the Bayerische Staatsbibliothek listing of manuscript Cod.icon. 140. Are we therefore just looking at a copy of the B da M chart made by the Maggiolo clan and not drawn at all for Sir Robert Dudley, and included as an available object at the end of the whole work? Nothing that has been written here-in and thus researched has given me an insight into the raison d’être for the peculiar presentation of the Nice chart. Except the possibility that it was produced firstly by Baldassare da Maiolo as a trial run for a further reduction to be included in an atlas which will of course be of a much reduced size than a normal Portolan Chart on a full vellum skin. Thus I opine that the second chart is the actual version reduced for inclusion into the atlas and that is the reason for the further squashing of the presentation we now observe. It was probably to be the frontispiece with annotation but no toponyms and followed by four full charts. The diamond is thus just a “nod” to the traditional wind rose design and the whole design method to aid the sale of the atlas. Both are therefore probably by Baldassare da Maiolo and although he did not know of Sir Robert Dudley, an atlas was in mind for the smaller version. Thus Sir Robert Dudley happened upon the perfect small scale portolan, but it was not for his work, and thus was relegated to the penultimate portolan in the last volume of the trilogy. That of course leaves open the question “was Baldassare da Maiolo preparing for a new atlas work to emulate the original atlas produced by Vesconte Maggiolo”? 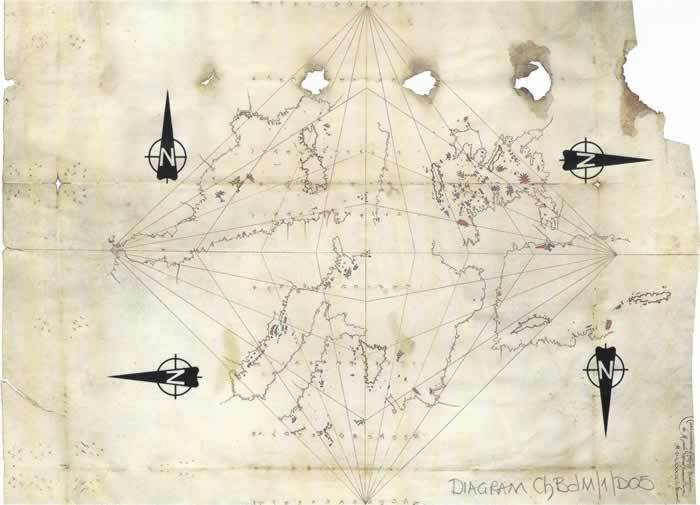 More questions than answers as is usual with these enigmatic Portolan Charts. M J Ferrar December 2017. 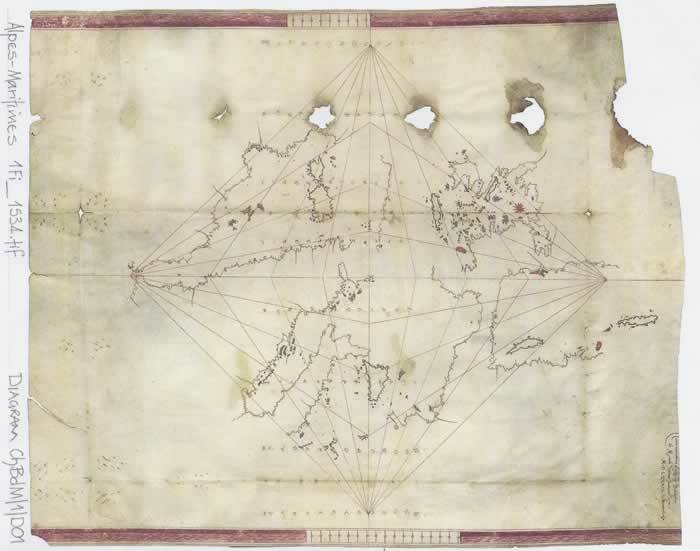 The Baldassare da Maiolo chart dated 1589. This is presently kept in the Archives departementales des Alpes-Maritimes in Nice. A copy is available, reference 1Fi_1543.tif, from Alain Bottaro, conservateur du patrimoine via an email/internet. « Quelques observations (de beotien) sur la carte muette et enigmatique de Baldasaro da Maiolo Visconte, (Genes) 1589 «. The chart from Dell’Arcano del Mare by Sir Robert Dudley is available from Bayerische Staatsbibliothek at information@bsb-muenchen.de. When searching the listing of the library for the various pages on the Cod.icon. 140 please note that the chart has no name or description other than “Umrisskarte Mittelmeer (N083) (Koloriert)” which I found confusing as it is the penultimate chart in the volume 3 atlas and is on page 221 of 224 and not cross referenced. It is followed by a chart drawn by Thomas Hood as the ultimate chart on pages 222 to 224. Please note that the sections of the Dudley text volumes 1, 2 and 3 have separate BSB Cod.icon numbers, 138, 139 and 140. An atlas by Vesconte Maggiolo, Genoa 1519 is available at BSB Cod.icon 135 entitled, Seeatlas ( alte welt und terra nova). Most of my texts regarding charts and atlas pages are within the Charts section of my website and endeavour to analyse each separately. The texts regarding the atlas of Petrus Vesconte, Diogo Homen and the first 14 Atlases described in “Les Cartes Portolanes”, by Ramon J Pujades, are a final statement on the distortions which emanate from the misuse of the Miliaria distance measure. Thus from 1311 to 1645 there is a continued copying of charts and atlases with little or no new drawing to reverse these errors.